When generating a GL transaction line, you can assign NetSuite locations, departments and Classes to your payroll locations. Once assigned, the class, location and department will be exported to any earnings lines, super expenses and PAYG expenses that are assigned to that location. 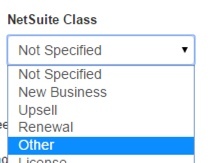 Click on the "Business" -> "Payroll Settings" menu and navigate to "Locations"
Click Save and your NetSuite classes, locations and departments will be assigned to the payroll location.